Act fast because time is limited. EPV Screens® now a bundling opportunity with Sony. 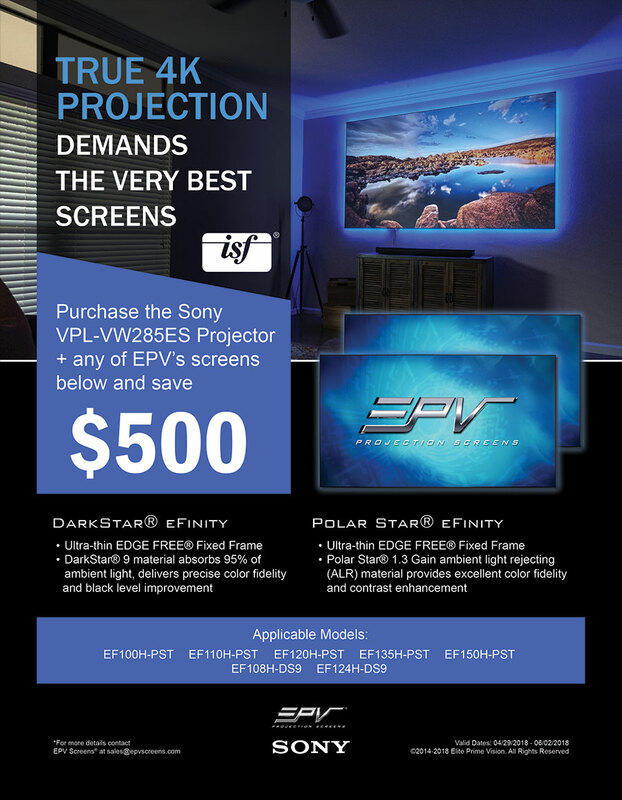 Buy a Sony VPL-VW285ES Projector, and save $500 on the purchase of an eFinity series of Edge Free® projection screens using either the DarkStar® or Polar Star® ambient light rejecting materials. Both of the world-class quality materials are ISF certified for reference grade image brightness, clarity, black levels and contrast. Even in bright interior lighting conditions, the materials deliver TV flat-panel brightness but in a size that is nothing short of a full theater in your own home. DarkStar® 9 is the ultimate home theater projection screen. It’s retro-reflective material incorporates micro-structural technology to deliver stunning brightness, clarity and picture quality in bright or dark rooms. The .9 gain projection screen delivers its ISF-certified performance while absorbing up to 95% of the washout effect caused by ambient light. The Polar Star® angular-reflective ALR material is ideal for a multitude of light-or-dark room applications from home theater installations to commercial integration. The 1.3 gain material incorporates a compound of light absorbent and light reflective micro-particles to provide the excellent color fidelity, contrast enhancement, and black level enhancement that is expected of an ISF-certified projection screen.